It must be quite something to take on a job in a new environment and be the best at it and now lead such a big club into the premiership. I for one am really looking forward to next season and what wee can achieve wit great leadership in Nuno and a strong team which can only get better! And better still new deal with Addias. I always look forward to new kits and am hopeful that this one will be quite special! I honestly believe this is a new era for us, investors willingly and able, manager who seems to be getting it soooo right, players looking pumped and eager to play all looking good for our return to the PREMIERSHIP! The right look and feel of kit would make it perfect! Congratulations to Nuno, and the entire team, those on and off the pitch! Happy, happy days!! 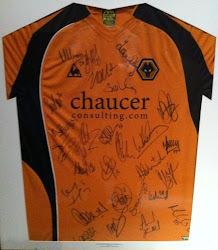 3 to 5 in Europe, 5 to 8 in Champions, come on Wolves we can dream and make it happen!